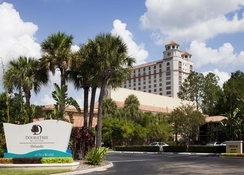 An official SeaWorld Hotel, DoubleTree by Hilton Orlando at Sea World is an idyllic family-friendly hotel that also caters to your business needs. 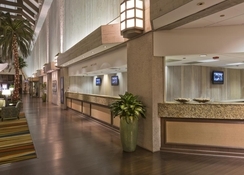 The hotel is situated right next to Orange County Convention Center, and well-connected to the major theme parks. With an exclusive on-site parking space, it provides free shuttle service to SeaWorld, Aquatica and Universal Studios, and chargeable shuttle to Walt Disney World. The hotel accommodates visitors in plush and spacious guest rooms with pool and garden views. All rooms and suites feature contemporary amenities and welcoming decor. The on-site fitness centre is the perfect place to stay fit during your holidays and the 2 swimming pools provide ultimate relaxation. 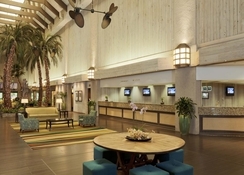 DoubleTree by Hilton Orlando at Sea World delights guests with 2 restaurants and a bar. The restaurant also boasts a kid’s menu. Plenty of drinking options to select from the menus at the hotel bars makes Double Tree a vanity drinking hotspot of the town. Strategically located at the 3-minute ride from Interstate Drive, the hotel in the heart of Orlando’s theme park district and close to the popular landmarks. You can reach the hotel from Orlando International Airport in just 10 minutes (15 km). The Orange County Convention Center is next door, and the nearby attractions include SeaWorld, Aquatica and Universal Studios, Walt Disney World, Pointe Orlando and I-Drive 360 Complex. A perfect hotel room makes you feel at home while you explore new stories on your vacations. 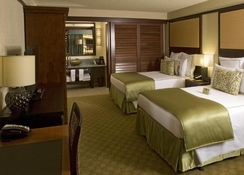 Categorised into plush rooms and suites, the various accommodations with premium occupancies pamper you at DoubleTree by Hilton Orlando at Sea World. The rooms are available in Florida-style accommodations among lush tropical landscapes, or in our 17-story tower with stunning Orlando views. There are some rooms accessible for guests with disabilities. 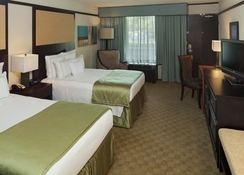 Rooms amenities include Sweet Dreams® beds, flat-screen TVs, wired and wireless internet access. The suites feature living room, walk-out patio, wet bar, dining table and sofa beds. The Double Tree by Hilton Orlando is a foodies’ bliss. The Laguna at The Double Tree serves a satisfying breakfast daily and a full day menu offering you a choice of appetizers, signature sandwiches, salads, steak and seafood in a casual atmosphere. The Bamboo Grille, offering a kids’ menu, is ideal for families. The outdoor bars and tranquil lounges offer a wide variety of cocktails to choose from. The poolside Barefoot Bar is a great place to enjoy a drink with light bites, or if you’re looking for an indoor drinking area, head to the Sonoma Lobby Bar and The Crazy Squirrel. The Market offers delicious pastries, beverages and made-to-order New York deli-style sandwiches. This Orlando Hotel caters to your pool needs with 3 outdoor pools. At the fitness centre, you can track your fitness levels while on a break. You can also play golf at the on-site mini golf course. Business travellers can make use of the modern business centre and the versatile meeting rooms. At a 7 minutes’ drive from the hotel, you get a chance to explore Universal Orlando Resort. Guests can avail free shuttle to SeaWorld, Aquatica, and Universal Studios Orlando. There’s also a shuttle service to Walt Disney World for a fee. Another nearby attraction, the Florida Mall is just 14 minutes’ drive from the property. The kid’s lounge takes care of the kids with games and activities. 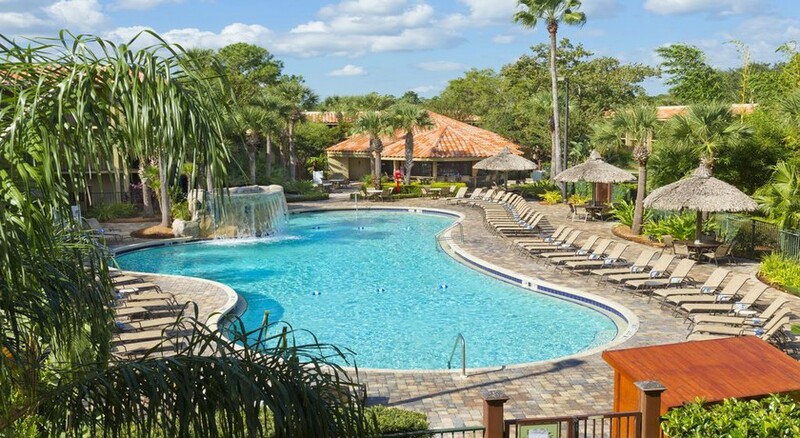 This Orlando Hotel caters to your pool needs with 3 outdoor pools. At the fitness centre, you can track your fitness levels while on a break. You can also play golf at the on-site mini golf course. Business travellers can make use of the modern business centre and the versatile meeting rooms. At a 7 minutes’ drive from the hotel, you get a chance to explore Universal Orlando Resort. Guests can avail free shuttle to SeaWorld, Aquatica, and Universal Studios Orlando. There’s also a shuttle service to Walt Disney World for a fee. Another nearby attraction, the Florida Mall is just 14 minutes’ drive from the property. The kid’s lounge takes care of the kids with games and activities. Pets are allowed on request; charges may be applicable. All credit cards are accepted for payment.